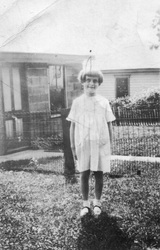 a photo of judy that she sent to earl during WWII. it is the only item that survived the love-letter burning. 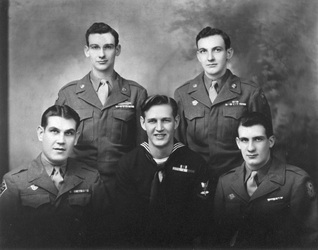 c. 1942. She appreciated words. He fancied the TV Guide crossword puzzle. She treasured and hoarded chocolate. He showed off his baseball skills in the back yard with grandchildren. She worried more than she should. He leaned over for a kiss to comfort those worries. She loved him, and he loved her right back. The years totaled fifty-nine and the moments, endless. Judy (as most call her because she hated her given name, Julia) and Earl's love affair began in the late 1930s and still continues today although Judy is alone. Judy was 19 and working as a file clerk in downtown Warren, Pennsylvania, and one day, Earl walked in. He was dating another woman at the company, and Judy tells the story that once he set eyes on her, "he liked me better and decided I was the better choice." She snagged him, and he caught her. Then, he left for England during WWII as a gun repairman. During his absence, they wrote incessantly. Love letter after love letter. Upon his return, in 1945 and at the age of 22, she married the love of her life. They lived for a brief time in an apartment above a funeral home which cemented Judy's "eeked out" feeling of death. They physically constructed a home together and lived there most of their lives. They raised three children. Judy was a housewife until 1973. When the children graduated from high school, she became a real estate agent and sold properties for almost 30 years. 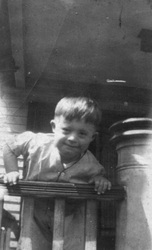 Earl worked for Penn Furnace as a heating system designer. They remained in Warren for a lifetime. When Judy met Earl, it began a different chapter in her life, completely opposite from the life to which she had grown accustomed. Her childhood took her through the Great Depression, teaching lessons of doing without, of frugality, and an appreciation of life's necessary things. Her younger brother Billy, born with Down Syndrome, died at the age of five. At 16, the unthinkable happened when her mother died from high blood pressure. Then, a month later, her father died of prostate cancer. 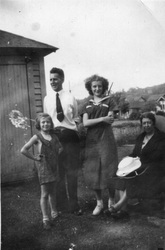 Judy and her younger sister Naomi were to be separated and taken care of by cousins. Feeling a sense of indebtedness to her sister, Judy chose to stay with her sister and both were moved into the home of the "mean aunt." Judy had dreamed of going to college and studying journalism. Now, dreams were to be set aside. Most believe that when the couple met, his encouragement and love provided Judy a passage from a life of loneliness, despair and heartbreak. She was finally able to triumph over the sadness that consumed her childhood and adolescence and begin a new life of hope. Their life together was long until ten years ago on a cold November evening, Earl leaned over to kiss Judy goodnight and his feet got tangled. He fell, breaking his hip which led to a minor heart attack and a shorter-than-required hospital stay. He had to get back home to Judy because he felt she needed him. As always, he thought of her first. As his health deteriorated, his tomorrow's became hazy to his family and to himself. 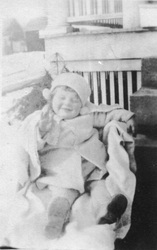 His granddaughter Julie (Judy's namesake) remembers making a joke about his fancy-button bed in which he spent most of his days. "This bed can do so many things," she said. "I'm amazed it can't fly." He leaned toward her, offering a weak smile and squeezing her hand. "Only if you fly away with me," he responded. They later shook on a deal which would put him beside her at the dining room table on Christmas day. He traced her face with his feeble hand and told her what a beautiful person she was, inside and out, that she was smart and going to do great things with her life. He was proud to call her his only granddaughter. "I'll see you soon," he offered at the end. It was the last time Julie saw her grandfather. Earl and Judy married for a lifetime. "While they did get married younger and have children younger, they also seemed to marry with the assumption that that was it," says Julie. "I know that there is no such thing as a perfect marriage, but my grandparents had 59 years together before my grandfather passed away and they loved one another just as much when he passed as he did when he married her. I think today (especially my generation) is too quick to rush to the altar because they think it's what they need to do, regardless of whether they think it'll last." Her children remembered Judy buying day-old baked goods and being extremely frugal, a lesson "left over from the depression." They struggled with money, but remained steadfast, vowing their children would always be fed. Judy loved the written word. Reading and writing were stressed in the family as being important tools. 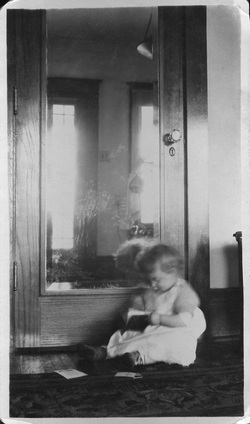 She and her granddaughter Julie would read the same books and then discuss them at length. Julie majored in journalism at Point Park University in Pittsburgh and always felt she was finishing what her grandmother never got to do. The value of family was treasured. 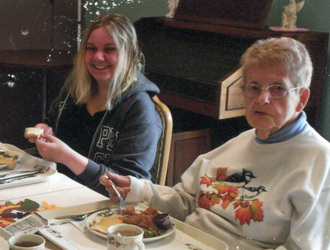 Judy took time to share her love of birds with her grandchildren on outings to the Audubon Society. She shared her love of gardening by creating an amazing landscape, complete with a giant goldfish pond. She created the "ugliest cookies" ever at Christmas - flashy frosted reindeers that looked more like disheveled camels but tasted amazingly good. Julie is moving into her new apartment soon and that dining room table used for construction of those "reindeer cookies" is going with her. "It's old, and I could probably find a newer table, but I'm really nostalgic to have that table because it reminds me of holidays and lazy Sundays at her house." Judy's character traits were built from adversity and joy. She is very emotional and doesn't handle change very well. She's very loyal, and like most women and mothers, she worries about things she can't adjust. And through it all, she never gave up. And what about those love letters? Years later when her children were young adults, Judy walked into the back yard and lit the letters, burning all the correspondence. Her explanation was simple: "What we wrote was private and nobody's business but ours." Her children and grandchildren thought her actions odd because it was quite romantic to have the love letters, yet Judy knew those secrets were hers alone. Julia (Judy) Elizabeth Snyder Nobles was born on November 4, 1923 in Warren, Pennsylvania. She was the daughter of Jessie and Minnie Snyder. Earl Robert Nobles was born on January 12, 1920. They married on January 5, 1945. They had three children: Lynn Nobles-Deuterman, John Nobles, and Denise Nobles-Miller. 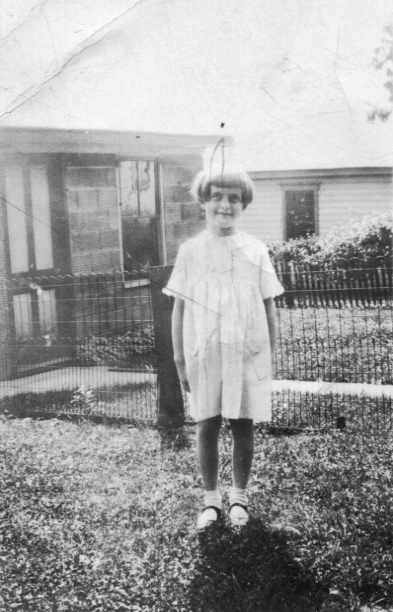 Today, Judy still lives in Warren and continues to be a chocolate addict. Although her days of hiding chocolate bars throughout the kitchen and in the trunk of her car are over, she still enjoys a treat now and then.